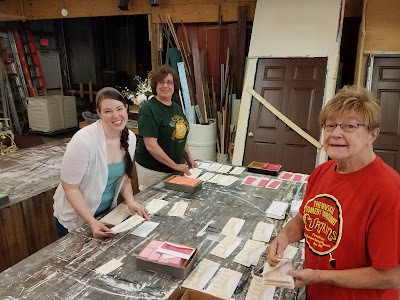 Putnam County Playhouse: SEASON TICKETS ON THE WAY!!!! Season ticket orders are in the mail and on their way to you! Our Ticket Committee under the leadership of Linda Gjesvold used the latest technology to fill the orders, stick on the address labels, and send the envelopes on their way. Actually, they spent many hours last Sunday pulling the tickets by hand and keeping everyone's request straight! Individual tickets will go on sale on Sunday, June 3, at 2 p.m. during our Annual Open House. Season tickets will also be on sale that day. Our season opens with the musical Annie June 7-9 & June 13-16. This show is sponsored by Hopkins-Rector and Bittles & Hurt. The mystery Agatha Christie's The Mousetrap continues the fun on July 12-14 & July 18-21. It is sponsored by Shuee's. The fun continues on with Disney's Beauty & the Beast to be produced August 9-11 & August 15-18. The sponsor for this production is First National Bank. A comedy by Neil Simon will close the season when we present Barefoot in the Park September 13-15 & September 19-22. It's sponsor is Rossok & Co. Insurance/Goodville Mutual. Click on the "Current Season" tab at the top of the page on the website to learn more about each production and sponsor!